KLA Tencor Corporation, ASML Holding N.V., and Steinbichler Optotechnik GmbH, the three top providers of automated optical metrology services, collectively held a share of 39.4% of the market value in 2014, states Transparency Market Research (TMR) in a new report. The key competitive strategy employed by most top players in the automated optical metrology market is driving company growth through constant product innovation and development. Transparency Market Research states that innovation for new products is a necessity in this market to maintain a strong foothold within its stiff competitive landscape. Apart from this, companies are also focusing on mergers and acquisitions. Close to half the market shares were held by regional players in 2014, and key players can look for opportunities in regional expansion through this fragmented set. Quality control, measurement, and inspection have thus become a core necessity in all manufacturing processes. The International Bureau of Weights and Measures is one such organization that is responsible for fixing measurement standards on an international scale. All companies affiliated with these industries must adhere to these standards to ensure high quality product quality, therefore ramping up the demand for automated optical metrology. While industries follow their own measurement standards for quality control, each organization possesses its own set of standard measurements. Furthermore, these clustered measurement standards can also prove to be contradictory to other standards, causing significant confusion and loss of product manufacturing time. Companies applying these non-standard measurement for international trade are the ones most hit. The lack of international measurement standards is therefore, something that needs to be resolved to improve the growth rate of automated optical metrology. The global automated optical metrology market is expanding at a CAGR of 7.6% within a forecast period from 2015 to 2021 in terms of revenue. This revenue is expected to reach US$1,565.3 mn by the end of 2021. 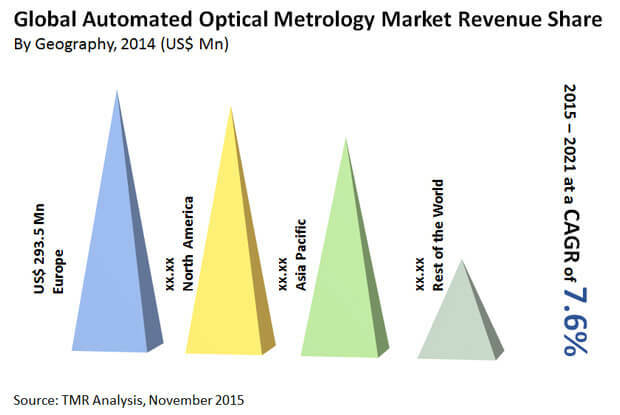 The region with the largest revenue share in automated optical metrology is Europe. Its revenue is expected to reach US$479.6 mn by the end of 2021. North America and Asia Pacific are expected to be a close second and third respectively. The largest scope of use for automated optical metrology services is found in the automotive industry. The revenue generated by automated optical metrology players from the automotive industry by 2021 is expected to reach US$421 mn. Coordinate measuring machines expected to generate revenue of US$657.6 mn by 2021. Automotive industry demand for automated optical metrology services by 2021 is expected to generate US$421 mn in revenue. Rapid increase in automated optical metrology demand from APAC expected to propel this region’s revenue to US$436.9 mn by 2021.